Mary Sharratt’s richly imagined new novel hinges on a set of historically documented witch trials that took place in 17th century England. Sharratt (The Real Minerva, Vanishing Point) brings her magic to Daughters of the Witching Hill (Houghton Mifflin), delivering a complex set of characters and establishing just the right note of doubt: were they innocent women? Or was there something to the accusations leveled against them? I speak in a low, warning tone, not unlike the growl of a dog before it bites. Man like him should know better than to cross the likes of me. Throughout Pendle Forest I'm known as a cunning woman, and she who has the power to bless may also curse. 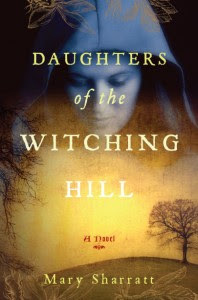 Daughters of the Witching Hill is very different for Sharratt, yet just as rich and compelling as this author’s previous works. Bess and her clan live and breath on the pages of Sharratt’s book -- at least for a while -- and we come away from the experience with a fresh view of what might really have happened in Lancashire in 1612.